The Grumman F7F Tigercat was the first twin-engined fighter aircraft to enter service with the United States Navy. Designed for the new Midway-class aircraft carriers, the aircraft were too large to operate from earlier decks. Although delivered to United States Marine Corps (USMC) combat units before the end of World War II, the Tigercat did not see combat service in that war. Most F7Fs ended up in land-based service, as attack aircraft or night fighters; only the later F7F-4N was certified for carrier service. They saw service in the Korean War and were withdrawn from service in 1954. The contract for the prototype XF7F-1 was signed on 30 June 1941. 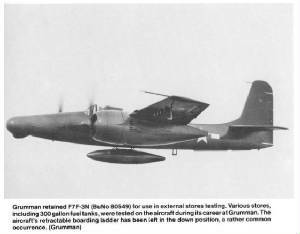 Grumman's aim was to produce a plane that out-performed and out-gunned all existing fighter aircraft, and that had an auxiliary ground attack capability. Armament was heavy: four 20 mm cannons and four 0.50 in (12.7 mm) machine guns, as well as underwing and under-fuselage hardpoints for bombs and torpedoes. Performance met expectations too; the F7F Tigercat was one of the highest-performance piston-engined fighters, with a top speed well in excess of the US Navy's single-engined aircraft—71 mph faster than a F6F Hellcat at sea level. The opinion of Capt. Fred M. Trapnell, one of the Navy's premier test pilots, was that "It's the best damn fighter I've ever flown." The Grumman F7F was originally named the "Tomcat" but this name was rejected as it was considered at the time too suggestive. The name would much later be used for the Grumman F-14. All this was bought at the cost of heavy weight and a high landing speed, but what caused the aircraft to fail carrier suitability trials was poor directional stability with only one engine operational, as well as problems with the tail-hook design. Therefore, the initial production series was only used from land bases by the USMC, as night fighters with APS-6 radar. At first, they were single-seater F7F-1N aircraft, but after the 34th production aircraft, a second seat for a radar operator was added; these planes were designated F7F-2N. The next version produced, the F7F-3 was modified to correct the issues that caused the aircraft to fail carrier acceptance and this version was again trialled on the USS Shangri-La (CV-38). A wing failure on a heavy landing caused the failure of this carrier qualification too. F7F-3 aircraft were produced in day fighter, night fighter and photo-reconnaissance versions. A final version, the F7F-4N, was extensively rebuilt for additional strength and stability, and did pass carrier qualification, but only 12 were built. 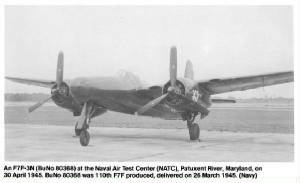 Grumman first proposed the name “Tomcat” for the F7F series. The Navy flat turned it down, tersely noting that "The name ‘Tomcat’ is unacceptable. It denotes feline promiscuity." Tigercat was deemed an acceptable substitute. 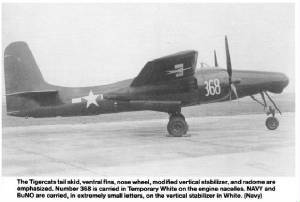 Twin-engine fighter-bomber aircraft, powered by two Pratt @ Whitney R-2800-22W radial piston engines. First production version, 34 built. Small numbers of F7F-2Ns converted into drone contol aircraft. The planes were fitted with a F8F Bearcat windshield behind the cockpit. The Grumman XTSF was a torpedo bomber design based on the F7F-2 Tigercat. 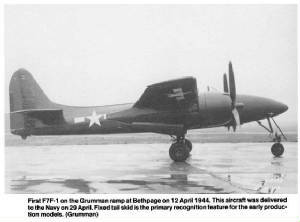 Grumman submitted its Model 66 design to the Bureau of Aeronautics in June 1944, and the existing contract for the XTB2F was modified to instead order two XTSF-1 aircraft. 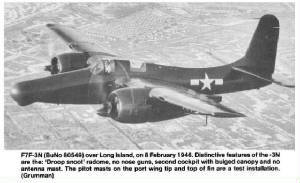 The contract was terminated in January 1945 due to the Navy's belief that the Grumman factory was already at capacity. The XTSF-1 was intended to carry two crewmembers, featuring an internal bomb bay and a SCR-70 radar set. 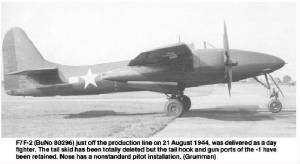 When ordering the termination of the XTB2F-1 project, the Bureau of Aeronautics also requested that Grumman prepare and submit a design study of a torpedo bomber modified from the F7F-2 twin-engined fighter. 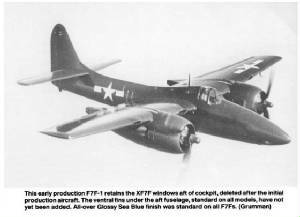 Preliminary data for Design 66 were submitted by Grumman in late June 1944, revisions and additional details were provided on July 21 and on August 17, BuAer requested that the XTB2F-1 contract be amended to conver the procurement of two XTSF-1s. Mock-up inspection took place in October 1944, and detailed engineering proceeded until the end of that year. In January 1945, however, the XTSF-1 contract was terminated as the Navy felt that Grumman's engineering load was already excessive. The XTSF-1 design differed primarily from that of the F7F-2 in incorporating a bomb bay, two seats in tandem, and an enlarged nose (with space being initially provided for an APS-3 or APS-4 radar but later being increased again to house a more powerful SCR-720 set). 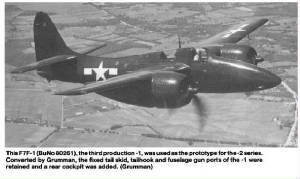 Most F7F-2Ns were modified to control drones for combat training, and these gained bubble canopies over the rear cockpit for the drone controller. Two Tigercats were evaluated, but rejected, by the British Royal Navy in 1945, preferring a navalized version of the de Havilland Hornet. Grumman first proposed the name “Tomcat” for the F7F series. The Navy flat turned it down, tersely noting that "The name ‘Tomcat’ is unacceptable. It denotes feline promiscuity." Tigercat was deemed an acceptable substitute. Thirty years later the culture evidently changed enough to make the name acceptable for Grumman’s last fighter. In civil service the Tigercat served as a fire-fighting aircraft with an 800-gal tank grafted to the centerline. In this configuration it served in the 1960s and -70s. The Tigercat had a less than memorable Navy career, with its longest service providing drone control, ironically enough of drone F6Fs. Although all versions were equipped to handle the Mark 13 air-dropped torpedo, operational squadrons did not train to employ this weapon even though the F7F would have been the fastest torpedo bomber around. The Fleet Air Arm was testing two-engine fighters, including the Sea Hornet, and borrowed two examples of the F7F for evaluation. 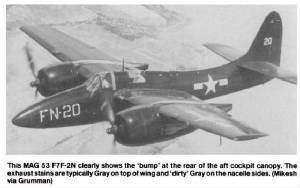 Reaching the same conclusions as the Navy, the FAA returned the two after a short trial. When its fuel tanks were empty the F7 would sit back on its tail with the nose wheel off the ground.This seriously disturbed Air Force personnel who reported it as an emergency.To get rid of frantic reports about this phenomenom the mechanics put a 55 gallon drum with an ammo crate on top to keep it level. fighter-bomber. 4 nose guns, 4 wing cannons. As XF7F-1, night-fighter version, minor changes. nose guns deleted, reduced fuel. As F7F-1, engine / armour upgrade. As F7F-3, two-seater night-fighter, nose radar. As F7F-3N, larger tail, minor improvements. F7F-3, conversions with special electronic equipment. Total this list - 249. 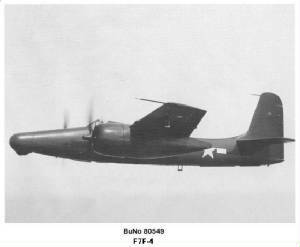 Missing BuNo: 80548 - Produced as a F7F-3, modified as the prototype F7F-4N and redesignated XF7F-4N. 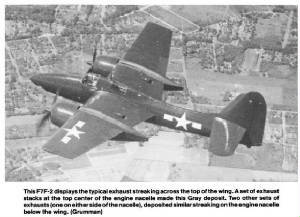 Grumman production records show a total of 250 F7F-3 aircraft, including the prototype F7F-4N 80548.